"Eric Carmen, Eric Carmen - OBI Box Set of 4 Minis"
ERIC CARMEN - Japanese OBI MINI REPLICA LP TITLES making a 4 CD Box Set- Japanese OBI MINI REPLICA BOX SET Japanese re-mastered Mini LP replica Limited Edition Collection Recorded from the finest Original Masters available. Special VERY RARE LIMITED EDITION BOX SET ONLY PRODUCED ON FUTURES FOR THIS ONE TIME PRESSING -- were only available in Japan. These are Japanese digitally re-mastered Mini LP replica CDs (the OBI Edition). 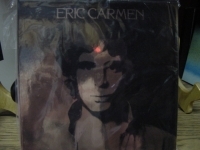 CD'S INCLUDED IN THIS BOX SET ARE - ERIC CARMEN/ERIC CARMEN - Track Listings 1. Sunrise 2. That's Rock'n Roll 3. Never Gonna Fall in Love Again 4. All by Myself 5. Last Night 6. My Girl 7. Great Expectations 8. Everything 9. No Hard Feelings 10. On Broadway 11. All by Myself [Single Version][*] 12. Sunrise [Live][*] BOATS AGAINST THE CURRENT - Track Listings 1. Boats Against the Current 2. Marathon Man 3. Nowhere to Hide 4. Take It or Leave It 5. Love Is All That Matters 6. She Did It 7. I Think I Found Myself 8. Run Away CHANGE OF HEART Track Listings 1. Desperate Fools Overture 2. Haven't We Come A Long Way 3. End Of The World 4. Heaven Can Wait 5. Baby I Need Your Lovin' 6. Change Of Heart 7. Hey Deanie 8. Someday 9. Desperate Fools & TONIGHT YOU'RE MINE Track Listings 1. It Hurts Too Much 2. Lost In The Shuffle 3. All For Love 4. Tonight You're Mine 5. Sleep With Me 6. Inside Story 7. Foolin' Myself 8. You Need Some Lovin' 9. Hungry Eyes 10. Make Me Lose Control 11. Reason To Try 12. My Heart Stops 13. As Long As We Got Each Other 14. Make Me Lose Control(Live) 15. Almost Paradise(Live) 16. Hungry Eyes(Live) This Limited Edition Collection has only VERY FEW made world-wide and are immediately Out of Print. Recorded from the finest Original Masters available. Comes with anti-static sleeves similar to Vinyl LPs, Cardboard packaging like an LP, includes extensive Liner Notes Booklet. Actual miniaturized version of the 12inch LP in 4inch CD version.